A simple red blood cell lysis method for establishing B-LCLs was developed with high immortalization efficiency, requiring a small amount of blood and saving time from initiation to cryopreservation. Liu, X., Xu, C., Duan, Z. A Simple Red Blood Cell Lysis Method for the Establishment of B Lymphoblastoid Cell Lines. J. Vis. Exp. (119), e55191, doi:10.3791/55191 (2017). A number of methods exist for the transformation of B lymphocytes by the Epstein Barr virus in vitro into immortalized cell lines. We have developed a new method with a powerful and simple strategy for the establishment of B-LCLs, the red blood cell lysis method. This method simplified the PBMC separation procedure with red blood cell removal, and used as little as 0.5 mL of whole blood for establishing EBV-immortalized cell lines, which can proliferate to large cell numbers in a relatively short amount time with a 100% success rate. The method is simple, reliable, time saving, and applicable to treating a large number of the clinical samples. Resting B cells could be transformed by the Epstein-Barr virus (EBV) in vitro into actively proliferating B lymphoblastoid cell lines (B-LCLs). B-LCLs are similar to germ cells in differentiation and development, and the somatic mutation rate of B-LCLs was only 0.3%1, with negligible genetic and phenotypic alteration. Therefore, B-LCLs, as surrogates for peripheral blood mononuclear cells (PBMCs), have substantially accelerated the progress of genomics, transcriptomics and proteomics study of EBV associated diseases2,3. Moreover, B-LCLs also have important application in screening monoclonal antibodies4,5. Several methods have been developed for the immortalization of B lymphocytes by EBV. The most major common procedures include the isolation of B lymphocytes and the use of B95-8 cell lines to produce infectious EBV. From isolation to transformation, these methods are divided into three strategies. 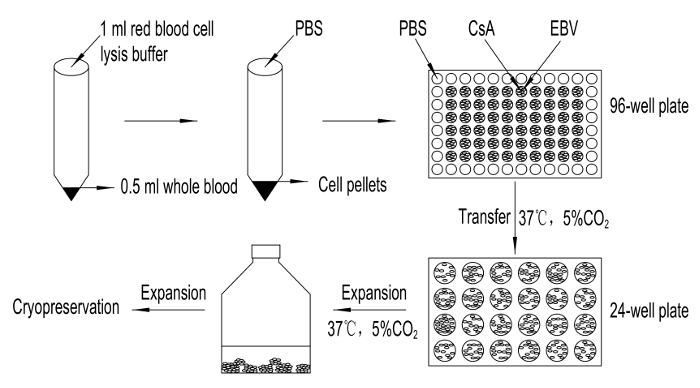 Lymphocytes are separated from fresh blood by density gradient centrifugation and EBV transformation directly6-8, named density gradient separation method in this study. However, other techniques overcome the difficulty of shipping fresh blood and use a procedure for freezing purified lymphocytes and subsequent thawing and EBV infection9-11. Cryopreserved whole blood can also be used for the isolation of B lymphocytes and transformation12,13. In addition to density gradient centrifugation to separate B lymphocytes, some researchers use a magnetic cell sorter to select B lymphocytes12. However, magnetic separation is an expensive, complex and time consuming process. Although these methods are useful to immortalize B lymphocytes with a high success rate, the need to treat a large number of clinical samples and the relatively small volume of blood require a simpler method for the establishment of a permanent cell line. Another less commonly used method is using whole blood as the source of nucleated cells for EBV infection and the establishment of B-LCLs. These methods simplify the technique by omitting the separation procedure. Only a small amount of whole blood, either fresh14 or frozen15,16, is sufficient to obtain the cell lines. Unfortunately, there is great variability in success from documents15,16 and several of our validation tests. Furthermore, transformed colonies are hardly recognized under a microscope because of the large contaminating impurities. Thus, a more reliable method for transformation is required. Based on the above considerations, we have developed a novel method to establish B-LCLs without previous purification of the lymphocytes, named the red blood cell lysis method. This method is convenient, time saving and applicable to a large number of samples. As little as 0.5 mL of whole blood was enough to obtain B-LCLs that are easily obtainable from infants and the elderly without significantly harming their health. This study was approved by the Ethics Committee of the Institute of Genetics and Developmental Biology, and the protocol follows the institutional guidelines for human welfare. On day 1, thaw B95-8 cells and culture in 6 mL complete RPMI 1640 medium, supplemented with 10% fetal bovine serum, 2 mM L-glutamine, and antibiotics (100 µg/mL streptomycin, 100 U/mL penicillin) in a T25 culture flask. Place the culture flask in 5% CO2 incubator at 37 °C. On day 2, observe the cell morphology under a microscope. Cells are in good condition when they are bright and round. Add 10 mL complete RPMI 1640 medium. On day 4, add 10 mL fresh complete RPMI 1640 medium, and then transfer to a T75 culture flask. On day 8, add 20 mL complete RPMI 1640 medium. Maintain the cells for 8 days without adding fresh medium, i.e., starvation. On day 16, observe cells observed under the microscope. Collect the cells in a 15 mL centrifuge tube, 12 mL/tube. Cryo-preserve at -80 °C for 1 h, and then rapidly thaw at 37 °C. Repeat 3 times until the virus particles are released from the cells. Centrifuge at 240 x g for 10 min at room temperature. Filter the supernatant through a 0.22 µm filter, aliquot, 12 mL/tube, and store at -80 °C. Add 0.5 mL whole blood anticoagulated by EDTA·K2 to a 15 mL tube. Put 1 mL red blood cell lysis buffer (filtered by 0.22 µm filter and thawed to room temperature before use) to the whole blood and mix well. Place the mixture at room temperature for 4 min. Then add 5 - 7 mL 1x PBS quickly to the stop reaction. Centrifuge at 240 x g for 5 min at room temperature. White blood cells will precipitate at the bottom of the tube. Discard the supernatant, and wash the precipitation by adding 7 mL 1640 basic medium. Centrifuge for 5 min at 240 x g at room temperature. Repeat twice. Resuspend the cell pellet in 300 µL transformation medium (RPMI 1640 medium, containing 20% fetal bovine serum and 10 µg/mL phytohemagglutinin (PHA)). Add 60 µL of 20 µg/mL cyclosporin A (CsA) to the cell suspension. Rapidly thaw an aliquot of EBV at 37 °C. Add 240 µL EBV to the cell suspension. Mix well and place the cell suspension to a 96-well plate, 200 µL per well. To avoid evaporation, add 200 µL 1x PBS to every well around of the 96-well plate. Place the plate in a 5% CO2 incubator at 37 °C. Change half of the medium once per week for the first month after EBV infection. Only a thick layer of cell fragments is visible under microscope at day 7 (Figure 2). After one month of EBV infection, lymphoblastoid cell clusters are visible under a thick layer of cell fragments under the microscope (Figure 2). Change half of the medium every 3 days until the cell clusters are clearly visible under the microscope (Figure 2). Typically, this process takes 10 to 20 days. After mixing, pipet the cells and transfer to the 24-well plate. Double the volume of culture medium with complete RPMI 1640 while it turns yellow. This process depends on the rate of cell growth. Subsequently, transfer the cells to T25 culture flask. Double the volume of culture medium as it turns yellow until the volume of medium expands to 10 - 15 mL. Change medium 24 h before freezing. Centrifuge cell suspension for 5 min at 240 x g. Count cells with a cell counter and freeze at a density of 5 - 10 x 106/mL in frozen stock solution containing 90% FBS and 10% dimethylsulfoxide (DMSO). Freeze at a rate of 1 °C per min to -80 °C and then transfer directly into liquid nitrogen. Prepare a B-LCLs single cell suspension with the 1640 medium containing 10% fetal bovine serum. Seed 3 x 104 cells per well onto 96-well plate, 100 µL per well. Place the plate in 5% CO2 incubator at 37 °C for 12 - 16 h.
Add MTT (5 mg/mL) to wells in which cells are growing and keep away from light for 4 h at 37 °C. Centrifuge cell plate for 10 min at 168 x g.
Remove supernatant and add 100 µL DMSO per well. NOTE: Be careful. Do not touch the needle-shaped dye crystals. Shake the plate for 10 min at low speed to fully dissolve the crystals. Measure absorption at 570 nm by using a microplate spectrophotometer. During the process of transformation, the morphological changes of cells are visualized by light microscopy (Figure 2). Small clusters of cells were clearly visible with the density gradient separation method after 7 days of infection, while only a thick layer of cell fragments are visible from the red blood cell lysis method. However, lymphoblastoid cell clusters are visible under the thick layer of cell fragments 30 days post infection. With more frequent medium change, the cell debris decreases and the cell clusters are clearly visible and present the same image established by the density gradient separation method. When cell lines were established successfully, the MTT assay was used to evaluate the viability of B-LCLs. According to the literature17, B-LCLs established by different methods were selected to detect the cell viability and 1640 medium was used as blank control. 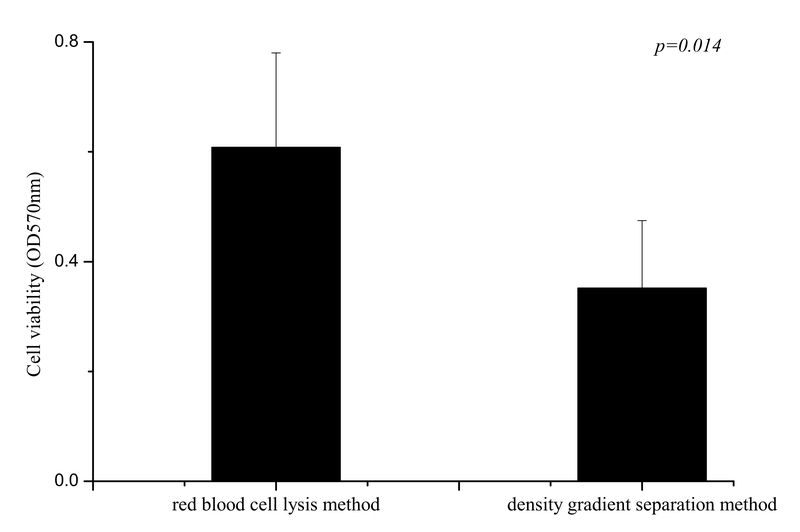 The data indicate that the cell viability of B-LCLs established with the red blood cell lysis method is significantly higher than the cell viability of B-LCLs from the density gradient separation method (Figure 3). Figure 1. Flow Chart of Procedure. Anticoagulant blood is treated with red blood cell lysis buffer before EBV infection followed by the addition of CsA. The infected B cells are grown at 37 °C in the presence of 5% CO2 to establish and subsequently expand B-LCLs. Please click here to view a larger version of this figure. Figure 2. Visualization of Cellular Morphological Changes in the Process of EBV Transformation. The left are B-LCLs established by red blood cell lysis method with 0.5 mL peripheral blood, and cell debris decreasing as time goes on. The right shows cell lines established by the density gradient separation method with 2.5 mL blood sample. Scale bar is 10 µm. Please click here to view a larger version of this figure. Figure 3. Comparison of Cell Viability for B-LCLs Established by Different Methods. Each bar represents mean ± SD. The results show that there was significant difference between the two methods (p= 0.014). Please click here to view a larger version of this figure. We report the development of a novel method for immortalizing human B cells from whole blood by lysing red blood cells, and its cell viability of established B-LCLs was evaluated by the MTT assay. The results showed that the cell viability of B-LCLs established by the red blood cell lysis method is much higher than that of the density gradient separation method. The major advantage of the red blood cell lysis method is that it is simple and requires a small volume (as little as 0.5 mL) of blood for establishing a permanent cell line with a high success rate and high cell viability. Only one simple lysis step is needed before EBV infection. Without previous purification of the lymphocytes, cell loss and cellular damage are avoided. Another obstacle of the density gradient separation method is hemolysis. Processing the blood after long term storage at inappropriate temperatures and shaking during transportation may lead to hemolysis, which will greatly influence the isolation of lymphocytes. Other studies showed that use of red blood cell (RBC) lysis resulted in higher numbers of viable PBMC than use of the density gradient separation method18 and lymphocyte subtypes were not influenced substantially19. Compared with the density gradient separation method, which is costly and cumbersome, the red blood cell lysis method is much easier, especially for treating a large number of the clinical samples and more practical for novices. In the study, we have immortalized 24 samples with a 100% success rate by using the red blood cell lysis method. Compared with the 90-94% of success rate reported by cryopreserved lymphocytes and freshly isolated lymphocytes20 with 2 - 2.5 mL blood, this success rate is much higher. Meanwhile, we also transformed fresh (0.5 mL) or frozen (even 1 mL) blood as described in references14,15 without separation, and the efficiency of transformation is much lower than that reported16 (data not shown). The present strategy not only improves immortalization efficiency significantly, but also reduces the volume of blood required to establish B-LCLs. Current technologies for EBV transformation use relatively large volumes of peripheral blood, approximately 2 - 2.5 mL blood20 to isolate lymphocytes while others require 10 mL or more10,21. This contrasts to the 0.5 mL of whole blood needed to obtain an immortalized cell line with the method described here. This method could be modified to successfully immortalize blood collected from finger pricks12, which could greatly facilitate preserve genetic resources from pediatric patients and the elderly. In addition, the cell viability of B-LCLs established by the red blood cell lysis method are higher than that of the density gradient separation method. The red blood cell lysis method avoids the mechanical centrifugal force in the process of density gradient centrifugation, which causes non-repairable damage to the cells. It suggests that the red blood cell lysis method is more suitable for genetic and functional studies, which requires large numbers of cells as quickly as possible. Our method will decrease the time from culture initiation to cryopreservation, which will save resources and reduce labor. A possible limitation of the red blood cell lysis method is the presence of contaminating debris derived from red blood cell lysates, which would block the clear observation of transformation in the first four weeks of EBV infection. However, this debris will be gradually removed with the medium changes. Another limitation is the loss of growing transformed cells, but this can be ameliorated by removing half of the supernatant in the first four weeks of transformation. Another possible modification to remove impurities is more frequent medium changes with greater volumes or washing the cell lines twice by 10 mL 1x PBS and then centrifuging at 168 x g for 5 min to remove impurities. In summary, this protocol provides a simple strategy for establishing B-LCLs with high immortalization efficiency, reducing blood volume and saving time between initiation and cryopreservation. The cell lines developed in the present study provide a valuable and cost-effective source of biomaterials carry out various studies. This work was supported by the key projects of Chinese Academy of Sciences (KFZD-SW-205), strategic biological resources technology support system of Chinese Academy of Sciences (CZBZX-1). Mohyuddin, A., et al. Genetic instability in EBV-transformed lymphoblastoid cell lines. Biochim Biophys Acta. 1670, (1), 81-83 (2004). Hu, V. W., Frank, B. C., Heine, S., Lee, N. H., Quackenbush, J. Gene expression profiling of lymphoblastoid cell lines from monozygotic twins discordant in severity of autism reveals differential regulation of neurologically relevant genes. BMC Genomics. 7, 118 (2006). Toda, T., Sugimoto, M. Proteome analysis of Epstein-Barr virus-transformed B-lymphoblasts and the proteome database. J Chromatogr B Analyt Technol Biomed Life Sci. 787, (1), 197-206 (2003). Chiorazzi, N., Wasserman, R. L., Kunkel, H. G. Use of Epstein-Barr virus-transformed B cell lines for the generation of immunoglobulin-producing human B cell hybridomas. J Exp Med. 156, (3), 930-935 (1982). Traggiai, E., et al. An efficient method to make human monoclonal antibodies from memory B cells: potent neutralization of SARS coronavirus. Nat Med. 10, (8), 871-875 (2004). Hussain, T., Kotnis, A., Sarin, R., Mulherkar, R. Establishment & characterization of lymphoblastoid cell lines from patients with multiple primary neoplasms in the upper aero-digestive tract & healthy individuals. Indian J Med Res. 135, (6), 820-829 (2012). Neitzel, H. A Routine Method for the Establishment of Permanent Growing Lymphoblastoid Cell-Lines. Hum Genet. 73, (4), 320-326 (1986). Oh, H. M., et al. An efficient method for the rapid establishment of Epstein-Barr virus immortalization of human B lymphocytes. Cell Prolif. 36, (4), 191-197 (2003). Louie, L. G., King, M. C. A Novel-Approach to Establishing Permanent Lymphoblastoid Cell-Lines - Epstein-Barr-Virus Transformation of Cryopreserved Lymphocytes. Am J Hum Genet. 48, (3), 637-638 (1991). Tremblay, S., Khandjian, E. V. Successful use of long-term frozen lymphocytes for the establishment of lymphoblastoid cell lines. Clin Biochem. 31, (7), 555-556 (1998). Reidy, J. A., Wheeler, V. A. 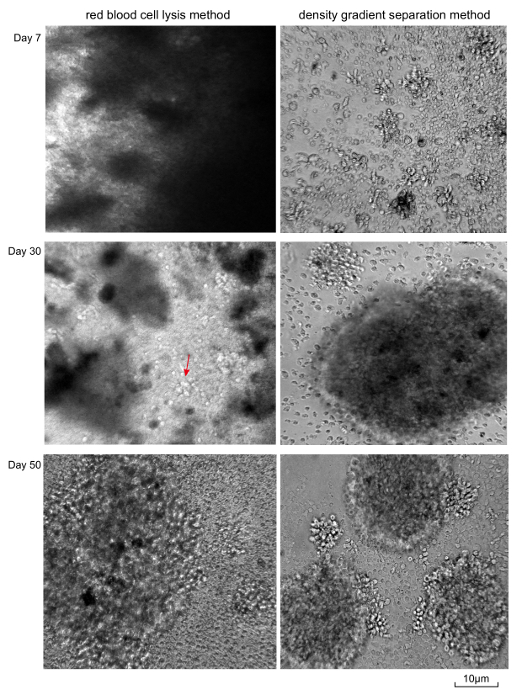 Sample age and Epstein-Barr virus transformation of cryopreserved lymphocytes. In Vitro Cell Dev Biol. 28, (6), 383-384 (1992). Amoli, M. M., Carthy, D., Platt, H., Ollier, W. E. R. EBV immortalization of human B lymphocytes separated from small volumes of cryo-preserved whole blood. Int J Epidemiol. 37, suppl 1 41-45 (2008). Lacelle, C., Wang, E. Establishing lymphoblastoid cell lines from frozen blood of extremely old individuals. Mech Ageing Dev. 123, (10), 1415-1418 (2002). Tohda, H., Oikawa, A., Kudo, T., Tachibana, T. A greatly simplified method of establishing B-lymphoblastoid cell lines. Cancer Res. 38, (10), 3560-3562 (1978). Ventura, M., et al. Use of a Simple Method for the Epstein-Barr Virus Transformation of Lymphocytes from Members of Large Families of Reunion Island. Hum Hered. 38, (1), 36-43 (1988). Chenevixtrench, G., Kerr, B., Walters, M. Lymphoblastoid Cell-Lines from Frozen Whole-Blood - a Quick and Economical Safeguard for Linkage Analysis. Am J Hum Genet. 46, (1), 635-636 (1990). Hansen, M. B., Nielsen, S. E., Berg, K. Re-Examination and Further Development of a Precise and Rapid Dye Method for Measuring Cell-Growth Cell Kill. J Immunol Methods. 119, (2), 203-210 (1989). Bogoslovsky, T., et al. Preservation and enumeration of endothelial progenitor and endothelial cells from peripheral blood for clinical trials. Biomark Med. 9, (7), 625-637 (2015). Ambach, A., Bonnekoh, B., Gollnick, H. Routine flow cytometric immuno-staining of T-cell perforin is preserved using diethylene glycol for erythrocyte-lysis but lost by the use of ammonium chloride. Exp Dermatol. 12, (6), 825-831 (2003). Beck, J. C., Beiswanger, C. M., John, E. M., Satariano, E., West, D. Successful transformation of cryopreserved lymphocytes: A resource for epidemiological studies. Cancer Epidemiol Biomarkers Prev. 10, (5), 551-554 (2001). Tosato, G., Cohen, J. I. Generation of Epstein-Barr Virus (EBV)-immortalized B cell lines. Curr Protoc Immunol. Chapter 7, Unit 7 22 (2007).